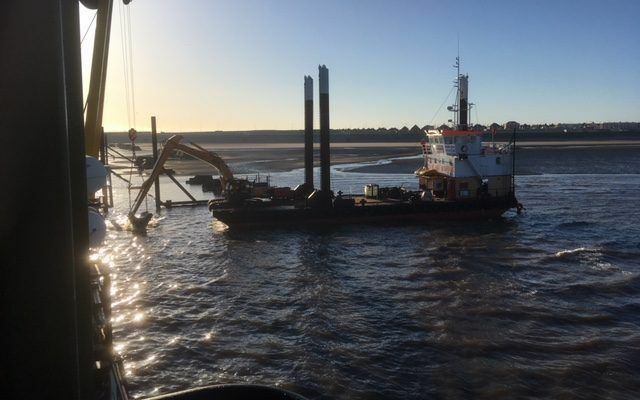 Jenkins Marine’s Dredging equipment has been kept busy this summer working near Fleetwood. 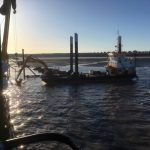 30m x 9m Backhoe Dredger ‘Doreen Dorward’ fitted with our 48t long reach excavator, and self propelled 300m3 capacity split hopper barge ‘NAB’ have been working for Specialist Marine Civil Engineering Firm ‘J. Murphy’ to provide dredging assistance for the installation of a large wastewater outfall in Anchorsholm. Both vessels have been working 24/7 from May through to Early August to get the project completed on schedule. The project has had some problems prior to Jenkins’ arrival. Last summer when the final section of outfall had been installed severe weather came in and caused extensive damage, and moving the position of the newly installed outfall. Due to the nearshore working environment, the work vessels are very sensitive to weather, and the decision was made to postpone repair work until after the winter. After a winter’s weather washing over the outfall the first task this year was to use the Doreen Dorward to uncover the 620m long damaged inshore section of outfall where buried. The outfall was some 2m diameter and weighed down with 26t saddle weights at regular 5.5m spacings. 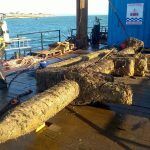 A submersible ‘Bell pump’ was fitted to our excavator and used to dredge around the weights, without the risk of damage from the excavator bucket, to enable use of divers to unbolt the 24 saddle weights from this section of pipe. This technique was also used to uncover the flange joint s on the outfall where connections had to be released and re-made. To enable the precise positioning of the dredger on the job a 3D RTK GPS Prolec dig system was installed to the excavator. 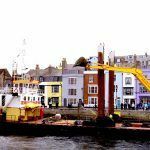 Other works included the re-dredging of the trench once the damaged section of outfall had been removed to restore the original design profile of the trench, which was 5m below seabed level, and the re-burring the outfall following installation. Spit barge ‘NAB’ was used to take spoil away from the outfall during dredging operations, and place spoil back on top of the outfall during backfill operations. To facilitate backfill operations a precision GPS survey spread was installed on the NAB to ensure the barge was exactly over the outfall prior to discharging the hopper over the outfall.